Cast: Kiefer Sutherland, Greg Cipes, James Belushi, Eddie Izzard, William Shatner, Janeane Garofalo. Directed by Steve 'Spaz' Williams. The Wild is another animated feature - and this one's almost a carbon copy of Madagascar. Except it's not as good. There must have been some very glum faces at the Disney studios when Madagascar appeared. These CGI movies take forever to make, so The Wild must have been well into production at the time - and their hearts must have collectively sunk when they realised quite how good Madagascar was, and how very similar in plot and concept it was to their baby. They even start out from a New York zoo, for heaven's sake. Still, they soldiered on and have made a pretty good fist of it - it's just a shame their rivals are so much better. Still, you don't kick Kylie out of bed because she's not as cute as Natalie Imbruglia, do you? As usual, there are some big names doing the voices - in this case 24's Kiefer Sutherland as Samson the lion and James Belushi as Benny the rat. 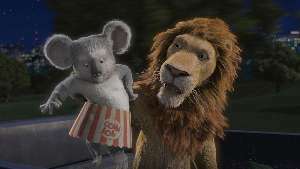 Eddie Izzard is a welcome and unusual choice as Nigel the koala, though you sense he would have been better had he been given more freedom to play with the character. Nevertheless, he's the best character by far. William Shatner pops up as the bad wildebeest Kazar, though they don't really make enough of his presence - some Star Trek jokes might have helped to highlight it - I didn't even notice it was him until I started writing this review and saw his name on the credits. It doesn't matter though, because despite its clear inferiority to the glorious Madagascar, The Wild is still good fun and will amuse the kids for a while during half term, whilst giving the adults just enough entertainment that they won't resent the trip. The Wild is nowhere near up to the class-leaders in any vital area, but it's plenty good enough to recommend. Go in expecting an adequate family movie and you'll be pleasantly surprised by its easy-going and charming ways. Wild it may not be, good clean fun it certainly is. To enjoy this film you should: have not seen Madagascar yet. The Wild was released in the UK on 26th May. 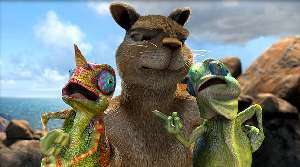 It is VERY similer to Madagascar....but it still is great. But i do prefer Madagascar.